When it comes to New World wines, us Europeans can be rightfully accused of being somewhat haughty. Our sense of superiority on matters of bacchanalia comes on the heels of a good few millennia of wine-making, from the ancient Greeks and Romans to our Gallic cousins the French, who can claim to produce the world's finest fermented grape juice. It would be very easy to dismiss the likes of South African, American, Chilean and Argentinian wine, from the sozzled perch of Old World arrogance, but this would be miopic. When all is said and done, fine winemaking comes down to a handful of variables, namely growing expertise, weather and terroir. In short, plant the best vines in the most fertile soil, nurture them well and hope for the heavens to be kind. In California's Sonoma County, which adjoins its more famous neighbour, the Napa Valley to the east, the weather and terroir combine to create some of the finest wine growing conditions in the world. While water is often in short supply in many areas, there is no shortage of wine-growing expertise, with many a great number of skilled vignerons swapping European climes for an altogether balmier way of life across the pond. 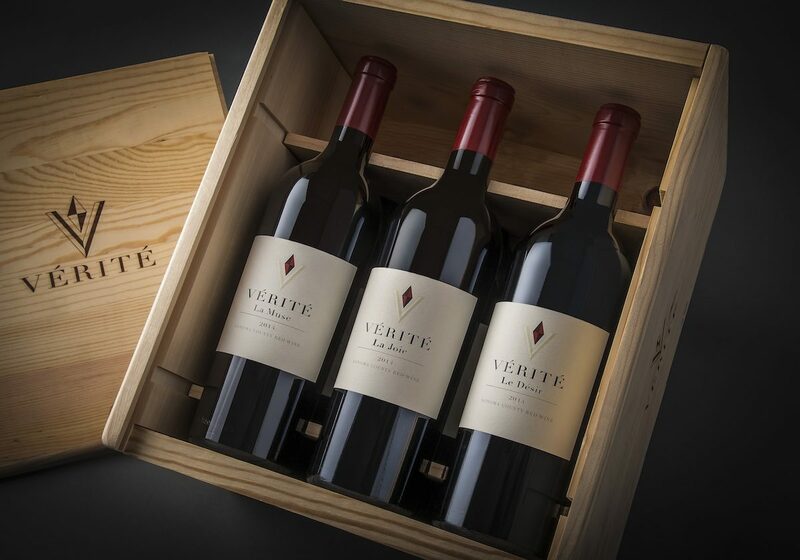 Earlier this year, I was lucky enough to sample the delights of one of Sonoma County's most lauded winemakers, Vérité, part of the lauded Jackson Family Wines estate. With more than 50 "micro crus" across four appellations, Vigneron Pierre Seillan carefully crafts each blend of Vérité, and does so with critical acclaim. Seillan's expertise is in crafting Bordeaux-inspired wines that represent a meticulously formed union of grape varieties, climate, soil expression and winemaking technique. The wines have been highly acclaimed, receiving over fifteen 100-Point Scores from Robert Parker Wine Advocate. Impeccably balanced and sumptuously textured in their youth, they have the weight and foundation to age for many years and are deemed to be outstanding investor wines. Earlier this year, I was lucky enough to sample each of Seillan's creations at a dinner held in London at Les 110 de Taillevent, a mouthful of a restaurant but well worth an expedition for gluttons and oenophiles alike. The 2014 iterations of La Muse, La Joie and Le Désir were on the menu and they did not disappoint. La Muse was seriously complex, with notes of cocoa, black fruit and violet, which worked beautifully with the accompanying venison tartare. La Joie was next up, oozing many layers of the gravelly terroir its produced from. It boasted a very lengthy finish so you could savour those black cherry and spice notes long after you gulped it down. Finally, Le Désir, perhaps my favourite, really evoked the minerality of the Sonoma terroir and seemed to deliver a more floral finish than its siblings. So far so delectable, but you haven't heard about the 2015 vintage yet. I'll leave that to Mr Seillan: "The 2015 vintage was one of the finest in my lifetime. While bud-break came in mid-March, a cool April and May with some rainy spells meant that bloom did not finish until June. A warm and dry June led to a July veraison. Of my 49 vintages, 2015 was the earliest so far, and we began picking the first micro-crus in Chalk Hill at the end of August. Harvest was completed on September 12 with our pick in the Alexander Mountain Estate. Although yields were low, the concentration and quality of the grapes in this vintage were outstanding." Lisa Perrotti-Brown of Robert Parker Wine Advocate, the wine industry's leading benchmarker, scored La Muse 97 points (out of 100), La Joie 99 points and Le Désir 100 points, confirming what Seillan thought to be his best vintage yet. This trio of Vérité wines, much like the county they hail from, doesn't do things by halves. Head over to Berry Brothers & Rudd (bbr.com) to wet your whistle with one of California's finest selection of red wines.